The headwaters of the Rio Chama originate on the east flank of the San Juan Mountains in southern Colorado. The river and its tributaries offer an unparalleled fly fishing experience with abundant fishing opportunities. Ten miles of the Rio Chama, above the mouth of Wolf Creek– located 4 miles below the New Mexico border, is private land requiring land owner’s permission to fish the Rio Chama and Wolf Creek. The Rio Chama at this point holds wild browns with cutthroats in Wolf Creek and rainbows in both streams. The Rio Chamita spills into the Rio Chama, about 9 miles below the Wolf Creek confluence with the Rio Chama. Access to the Rio Chamita is from a dirt road one and a half miles north of the town of Chama. A couple of miles north of Chama traveling on NM 17 there is a parking area to access a trail to the Rio Chama for about a 3-mile stretch upstream in the Edward Sargent Wildlife Area. Camping is also available at this location. Fishing in this stretch is very good with dry flies in the evenings and nymphs all day. There are special regulations on this stretch of the Rio Chama. South of Chama 15 miles on US 64/84 is the confluence of the Rio Brazos with the Rio Chama. Most of this run of the Rio Chama is on private land, except for a 4-mile stretch a couple of miles south of town. Nymphing is the successful method here. Traveling on US 64/84, before reaching the confluence with the Rio Brazos drive east on NM 512 about 9 1/2 miles to the location of the well-known Corkins Lodge. There is about a mile and a half of public access below Corkins Lodge. The entire Rio Brazos, from the confluence, occupies private property with permission required to fish the stream. Below the confluence with the Rio Brazos, the Rio Chama offers several miles of excellent dry fly and nymph fishing as it picks up the tailwaters of Heron Lake then pours into El Vado Reservoir. The best access is at the Rio Chama Wildlife Area off NM 112, a few miles south from US 64/84. The Rio Chama, at this point, can be quite wide–over 40 ft. and has great runs, pools and large boulders that create great pocket water. The river holds rainbows and wild browns and there is ample opportunity to catch large trout. Who knows maybe even a new state record? 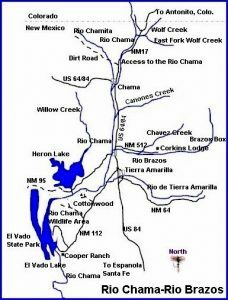 There are special regulations on the Rio Chama in the Rio Chama Wildlife Area. Dry flies and nymphs are good in this part of the Rio Chama but large flies, such as streamers are the best chance for catching some unusually large fish. There are plenty 18″ or larger trout in this fishery. Take US 84 from Espanola to Tierra Amarilla and then on to Chama or El Vado.